2-in-1 Twist Hose & Jet Sweeper Nozzle Nothing beats the durability of solid brass construction when it comes to power and performance in the yard and garden. Wash the car, water the plants or pressure wash the patio and siding - you'll find dozens of uses for the Sun Joe SJI-4BHNC solid brass combo pack! The multi-purpose Sun Joe Twist Hose Nozzle quickly adjusts from gentle shower to high-pressure stream in one smooth motion. Resists damage, stands up to abuse for reliable operation to last a lifetime. 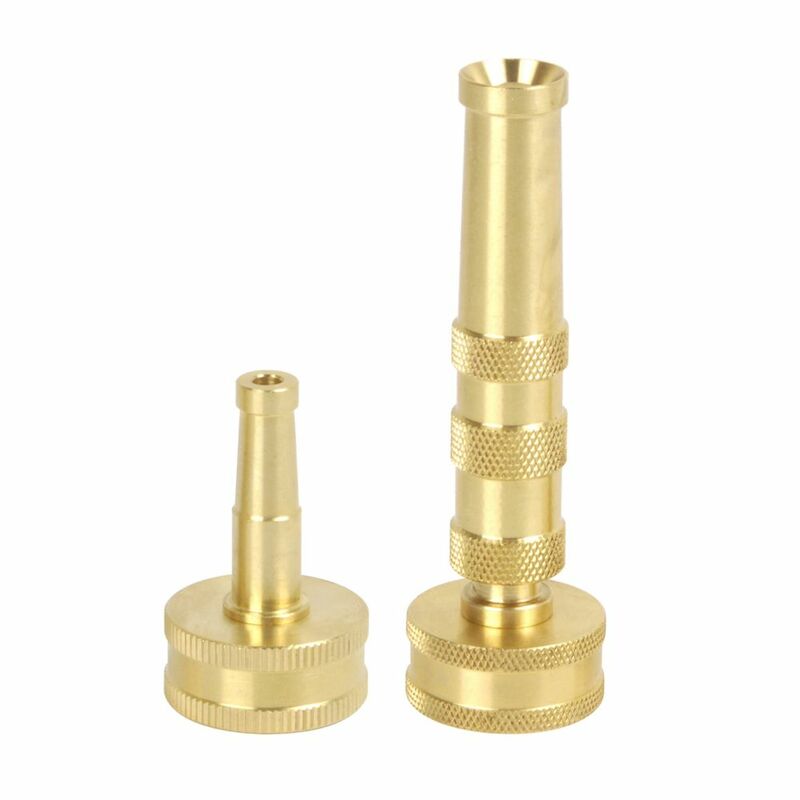 Solid brass one-piece inner core resists leakage for exceptional performance. Turn your conventional garden hose into a high-pressure power washer with the one-piece Sun Joe Jet Sweeper Nozzle attachment. Instantly convert your standard garden hose into a pressure washing powerhouse to produce a concentrated jet stream to tackle a variety of heavy-duty cleaning tasks. 2-in-1 Twist Hose & Jet Sweeper Nozzle is rated 4.6 out of 5 by 38. Rated 5 out of 5 by Robert1953 from Both hose nozzles work extremely well.... Both hose nozzles work extremely well. Rated 5 out of 5 by Rack from These fit tight on any garden hose. I love how the smaller nozzle acts like a power wash on our d... These fit tight on any garden hose. I love how the smaller nozzle acts like a power wash on our dirty cement and house. Rated 5 out of 5 by Danny from Simplicity usually provides the best functionality. This nozzle is great.... Simplicity usually provides the best functionality. This nozzle is great. Gives you the full range from mist to powerful jet stream. And it’s solid. Rated 4 out of 5 by Auf from Good construction. Jet nozzzle gives good, steady stream, but... Good construction. Jet nozzzle gives good, steady stream, but has no cut-off (must turn off at source faucet). Rated 5 out of 5 by Ted from VERY GOOD, THANK YOU.... VERY GOOD, THANK YOU.